The reasons and causes/effects of juvenile delinquency is a topic that is beyond my scope and expertise, especially since the magic bullet on preventing JD has not been reached. However, there are several elements that “cause” juvenile delinquency and gangs, some of which include economic deprivation, poor housing, racial strife, lack of education and little or no activities to keep youth busy. RC was born in New York City in September 1939 and was the fourth child in a family of eight children (one of his brothers died at age 34 in 1962 from a drug overdose). His mother became pregnant at 16, but then married another man with whom she had the other children. When RC was 6 years old, his father ran off with another woman, leaving the child-rearing duties to his wife who also had to work in order to provide for the family. His father died in 1953 from heart failure when RC was 14 years old. Two of RC’s older brothers had criminal records and one of his sister’s was later charged with prostitution and was suspected of being a drug user. Although the details and circumstances of this are unclear, the Psychiatric Clinic of the Manhattan Court warranted that RC be submitted to an examination when he was 9 years old. He was found to be without psychosis and estimated to be of “dull normal intelligence.” He was diagnosed as an inadequate type. RC and his brothers and sisters and Mom lived in a tenement at 1626 Park Avenue in Manhattan, a depressed area of Harlem that was rife with youth gang activity. With his Mom working to provide for the family and no good example from his brothers and sisters and no father to speak into his life positively, RC had nobody to control his youthful desires or mischief. 1626 Park Avenue, where RC of the Python Knights gang lived. RC attended school at PS 57 from the age of 6 to 12, completing 6th grade. His attendance was good and his grades were C’s and D’s. However, in 1951, when RC was 12 he had to be transferred to a “600” school – PS 612 – which was a school for emotionally disturbed children. There he was aggressive, stole from teachers and fought with teachers — when he was there. 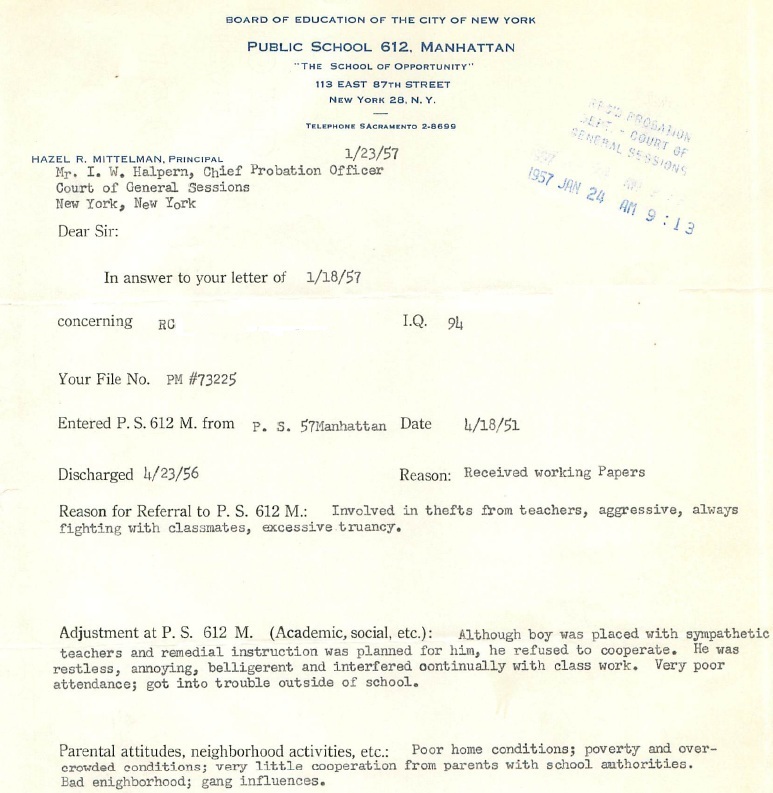 He had excessive truancy at PS 612 and from the years of 1951-1956 he was known to the Juvenile Aid Bureau on six occasions for pickpocketing, opening and closing taxi doors to steal items, obstructing the sidewalk by watching a dice game and stealing a pair of shoes from Gimbel’s Department store. On December 9, 1953, around the time his father died, RC was adjudged as being habitually truant and was placed on probation in February. 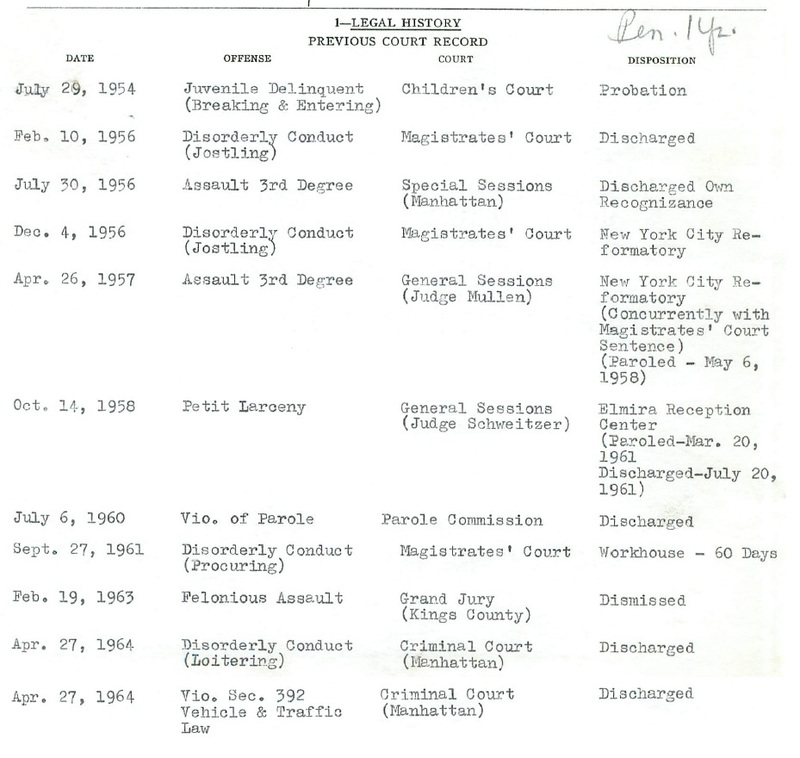 While on probation he was caught for breaking and entering and was declared a delinquent on April 26, 1954. 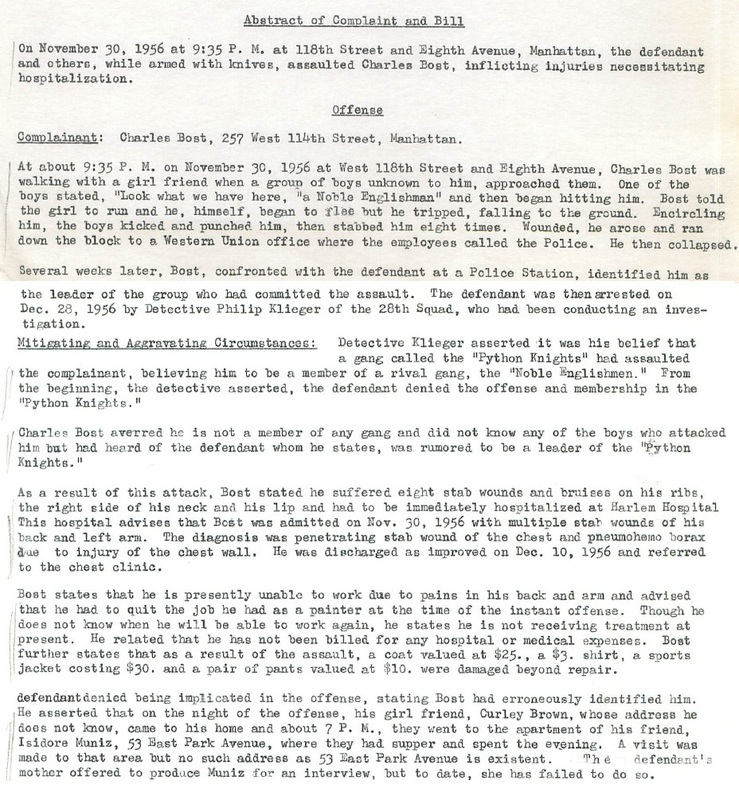 Sent to Willowbrook State School by the Children’s Court as a “mental defective” he was returned less than a month later, as he was found to be NOT mentally defective. While there, RC was wild, insolent, assaulted other patients, and tried to form a gang there. ……he was evasive and his statements were at variance with the facts given by his employers and family. Hostile and child-like in effect, he seemingly has maintained an irresponsible mode of existence, tending to seek emotional support from his peers in venting feelings of hostility engendered by a deprived childhood and the lack of a father figure with whom he could identify. The product of a very marginal economic circumstance, he has a low self-esteem and a poorly constituted self-concept which leads him to seek ego enhancement and a feeling of social identity in aggression. Dull and sensitive, he lacks insight into his motivations and projects the blame for his troubles on others. Awaiting trial on two complaints and sentencing on a third, he regards authority figures as hostile and threatening and his partly blunted emotional affect appears to be an infantile ego defense against guilt feeling. The defendant is a tall, heavy set individual, who relates on a superficial level. During the interview situation, he was evasive and indifferent… He appears to have little insight into his personality difficulties and frequently projects the responsibility for his troubles on others. Intellectually limited and with deep feelings of inadequacy, he resorted to the use of narcotics and supported his drug habit through illegal means. He has disregard for authority and his relationship with authority figures has always been of a hostile nature. His capacity for change appears questionable. I would like to state that not all gang members’ had stories like this, but I would say that many did. I don’t know what happened to RC, or if he is alive now, but his sad story shows that he didn’t have much of a chance from the very beginning and because he did not control himself, he was responsible for the near-death of Bost, who ended up staying in the hospital for 10 days and was in pain after that to the point where he could not work.